Nestled in the southern part of the Texas Hill Country, time stands still for a few Saturday nights each month. 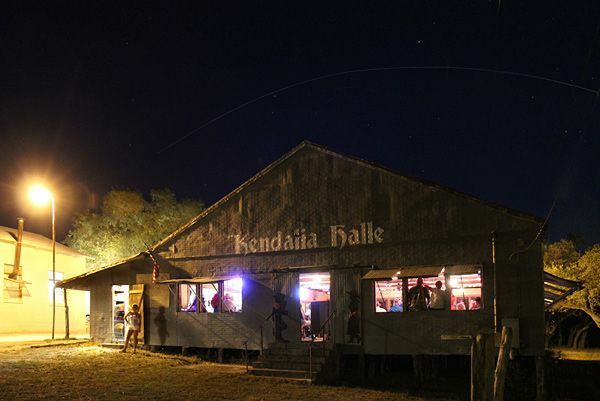 As a tribute to the small community of Kendalia, the fun loving folks of the area headed by the Nicholas Syring Musical Group, erected Kendalia Halle in 1903 for entertainment, plays, family gatherings and of course, dancing. Since folks had to travel great distances by wagon, it was a weekend event. The children slept on the benches surrounding the dance floor, food was brought by everyone to share, and of course drinks were served. If a person became too rowdy, he was chained the tree outside the hall until he sobered. Several German halls were built in the area around this time and Kendalia Halle is one of the best examples of the architectural structure of these historical gems. Built of red fir lumber which was shipped from Oregon by train to Boerne, then hauled to Kendalia on horse-drawn wagons, Kendalia Halle is a testament to these turn-of-the-century buildings that stand today. Often referred to as one of the best dance floors in Texas, many a dancer has boot scooted across its wood. Since 1996 the dancehall has undergone major renovations including straightening the hall by moving it 12 inches using pulleys and reinforcing the building’s foundation with concrete and steel. The inside has been wood paneled and the roof has recently been insulated to help cool down the hall on warm summer evenings. Keeping the spirit of this great historic dance hall alive and hearing that folks really enjoy themselves, is the best reward.